Data buoys are becoming a more popular investment for coastal communities that want wind, wave and water quality information delivered straight to their computers and phones. But the buoy floating in Lake Erie off of Erie, Pennsylvania, might be the only one with its own T-shirt design. And its own business cards. And window clings. “It’s a fun project and people have been very positive and very excited about it,” said Jeanette Schnars, executive director of the Regional Science Consortium based at the nearby Presque Isle State Park. 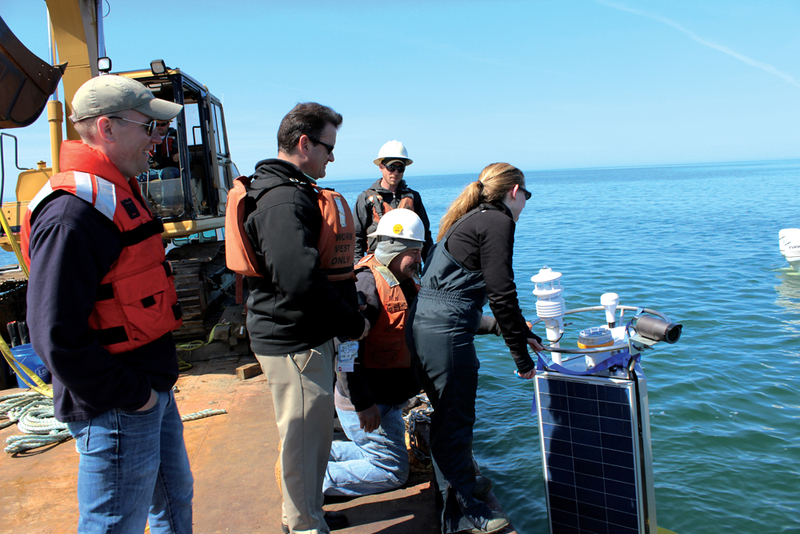 The buoy, nearing the end of its first season in the water, is the first to deliver real-time measurements of wave height and frequency on Pennsylvania waters of Lake Erie. That’s important information for the people who flock to the area every summer for boating, fishing and swimming. Though the state claims only about 6 percent of the Lake Erie shoreline, it makes good use of it. Presque Isle State Park, with its sandy, lagoon-spotted point that juts out into the lake, draws 4 million visitors a year. That rivals and even surpasses the totals for some national parks, and many of those visitors take to Presque Isle’s sandy beaches. The region’s perch, walleye and bass fisheries draw recreational anglers and fishing tournaments year-round. And it’s those people, as well as the locals who make use of the water, who are meant to benefit from the buoy. While other moorings tend to supply data to scientists for studies and forecasts, the Regional Science Consortium has made a big public awareness push to teach people how to access the buoy’s readings to stay safe on the water. Hence the T-shirts, business cards and window clings, all of which sport a QR-code that sends scanners to the buoy website. The push appears to be working. The buoy was on the front page of the Erie Times News the day after it was deployed, and Schnars says the local TV stations feature its data and video clips almost daily during their weather forecasts. The traffic to the website grew throughout the summer to around 48,000 sessions in both July and August. Visitors to the website can see a recent 10-second video clip recorded by a camera atop the buoy, as well as a full suite of meteorological, wave and water quality variables. The wave data can help charter captains plan for additional fuel costs when the waters are rough or save recreational boaters the hassle of trailering up to the lake only to find unsafe conditions. The wave heights will also be worth watching in October and November as the fall storms blow in. The consortium’s people at the Tom Ridge Environmental Center can walk down to the Presque Isle beach to see those big waves crashing over the breakwaters, but the buoy lets them know what’s going on a few miles offshore. Beyond just keeping people informed of lake conditions, the data are also going to the National Data Buoy Center, where they’re picked up by the National Weather Service to improve their forecasts. The Pennsylvania Fish and Boat Commission is using the information for fish studies, while local water authority Erie Water Works is watching the temperature and turbidity readings. But the boaters, anglers and beachgoers are likely the most important group of users, especially because the buoy’s future is in their hands. 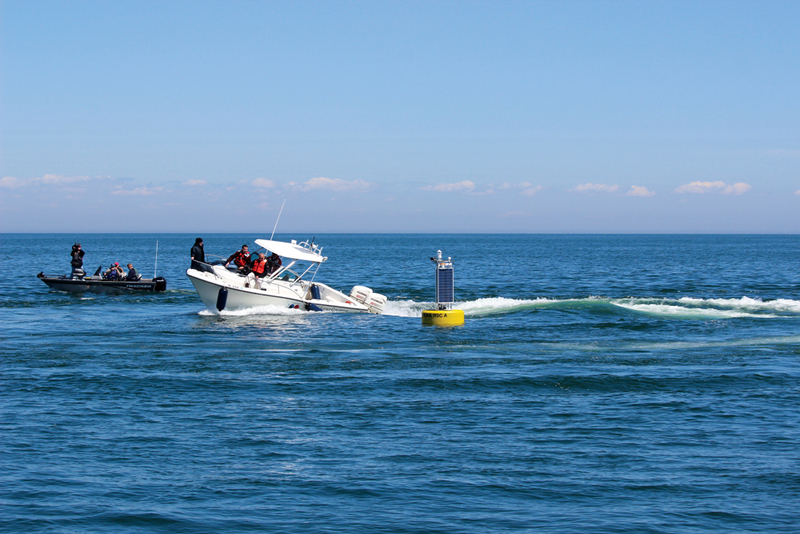 A grant from the Great Lakes Observing System will cover the buoy through the 2015 season. But after that, they’ll rely on donations and, of course, T-shirt sales. The consortium is launching a new website soon to make it simple to donate to an account that will exclusively fund buoy operations. Prior to the 2016 season, they hope to have enough to cover deployment, maintenance and retrieval in November before the lake ices up. “We don’t want to get it out there and not be able to get it back in,” Schnars joked. Where can we buy these t-shirts and window clings? Receive a complementary window cling with the purchase of your Tshirt!